Bengaluru, 11 June 2016: The Akshaya Patra Foundation has embarked on a pilot project ‘Giving Every Dream a Chance’ in the year 2015-2016. Akshaya Patra believes that every child has a dream and each dream is valid and hence intends to provide the right path to the child. The project aims to initiate a sponsorship programme to ensure continued support to 100 children, conduct mentorship programmes to nurture talents and to identify more children with unique dreams across the country. This unique programme was launched on June 11, 2016 at the Vivanta by Taj by Chief Guest, Mrs. Sudha Murty, Chairperson, Infosys Foundation, a benevolent supporter of Akshaya Patra. The event was presided by Shri Madhu Pandit Dasa, Chairman of The Akshaya Patra Foundation, in the presence of Mohandas Pai who also serves as an independent trustee of the foundation. Sushruthi Krishna, Femina Miss India Supranational 2016, graced the event in support of the initiative. Celebrated Bollywood musician duo of Sona Mohapatra and Ram Sampath presented the theme song which was exclusively composed for the initiative. The event was well attended by eminent citizens from all walks of Life. Akshaya Patra is proud to launch the dreams of its three mid-day meal beneficiaries: Manjula, the debuting actress; Shivu, an aspiring astronomer and Shekar, a chef in the making. Akshaya Patra facilitated them with a two month mentorship programme wherein the children were tutored, groomed and guided by the experts in their respective fields. Manjula was mentored by Dr. Zulfia Shaikh, Founder-Director of Bangalore School of Speech & Drama. Shivu was tutored by Mrs. Preethi Krishnamurthy, a senior research fellow in astrophysics. Shekar’s passion for cooking was nurtured by renowned celebrity Chef Ramasamy Selvaraju, Executive Chef at the Vivanta by Taj. Vivanta by Taj, MG Road, supported the initiative as hospitality partner while pledging to continue supporting Shekar till he achieves his dream. The all new Akshaya Patra App was also launched at the event. Big FM 92.7 joined hands with Akshaya Patra as official radio partner and Bfirst.com participated as online partner. The event was organised by Eventsource and was also supported by webcast partner, 24 Frames Digital. About The Akshaya Patra Foundation: The Akshaya Patra Foundation is a not-for-profit organisation headquartered in Bengaluru, India. The organisation strives to fight issues like hunger and malnutrition in India. By implementing the Mid-Day Meal Scheme in the Government schools and Government aided schools, The Akshaya Patra Foundation aims not only to fight hunger but also to bring children to school. Since 2000, the organisation has worked towards reaching more children with wholesome food on every single school day. Akshaya Patra Foundation is continuously leveraging technology to cater to millions of children. Its state-of-the-art kitchens have become a subject of study and they attract curious visitors from around the world. In partnership with the Government of India and various State Governments and inestimable support from many philanthropic donors and well-wishers; Akshaya Patra has grown from humble beginnings serving just 1,500 school children across 5 schools. 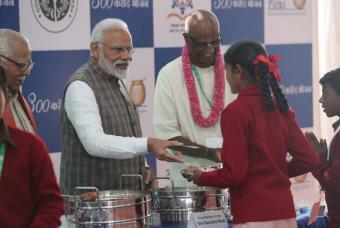 Today, The Akshaya Patra Foundation is the world’s largest (not-for-profit) run Mid-Day Meal Programme serving wholesome food to over 1.5 million children from 11,360 schools across 10 states in India.